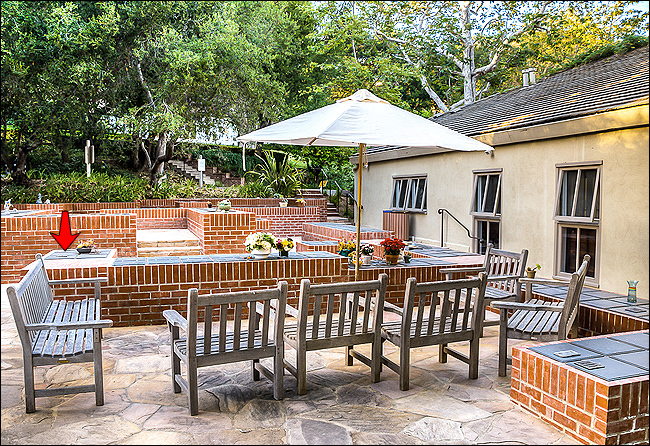 St. Matthew's Church, located in the foothills of Pacific Palisades, has appeared in at least one Hollywood movie, and includes a school that attracts children of the stars. But its most important connection to Hollywood is hidden away behind the church. 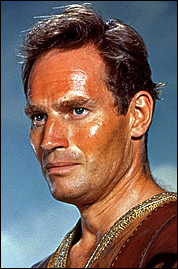 The ashes of Academy Award-winning actor Charlton Heston - the star of "Ben-Hur, the man who played Moses and parted the Red Sea in "The Ten Commandments" - are interred in a modest brick columbarium outside the west side of the church. Heston also played Michaelangelo in "The Agony and the Ecstasy", John the Baptist in "The Greatest Story Ever Told", the title champion in "El Cid", the circus manager in "The Greatest Show on Earth", and went on to star in the '60s/'70s sci-fi epics "Planet of the Apes", "Soylent Green" and "The Omega Man". He was a regular at Sunday services here at St. Matthews, where the other parishioners took his celebrity in stride, and where his widow, Lydia Heston, still attends (the two were married for 64 years). The Pacific Palisades Post quotes the church's Rev. Michael Scott Seiler as saying: "There was the one time when I had to read from the text of Moses and the burning bush and there he was near the front row. The irony was not lost on either of us." 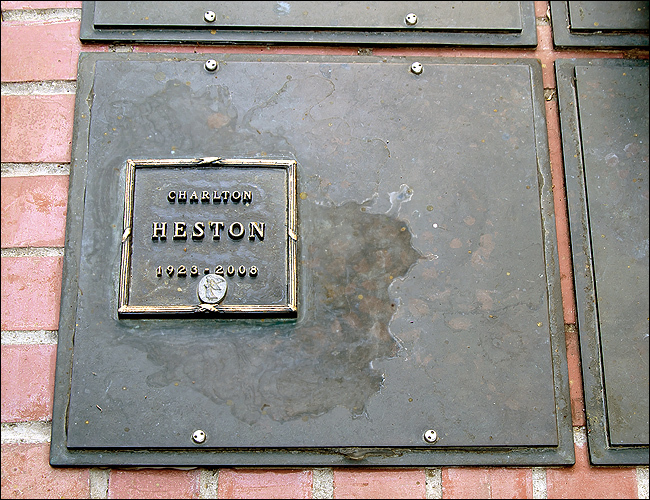 They held Charlton Heston's funeral at St. Matthews in April of 2008. Attendees included Nancy Reagan, Tom Selleck, then-Governor Arnold Schwarzenegger, Olivia DeHavilland, Keith Carradine, Pat Boone, Julian Glover, and filmmakers Oliver Stone and Rob Reiner. But beyond Mr. Heston, the church does have other Hollywood connections. Pacific Palisades is a wealthy community nestled in the hills between Malibu and Santa Monica, and home to more than a few celebrities. Two stars who sent their children to school at St. Matthews are Tom Hanks and The Eagles' Glenn Frey. Actor Stephen Collins (who played the Rev. Eric Camden on the popular family TV show "7th Heaven") says that St. Matthews is his real-life church. And "The Virginian" star, Doug McClure, also had his funeral held here, in 1995. The church dates back to 1941, but moved to its current location in 1953. 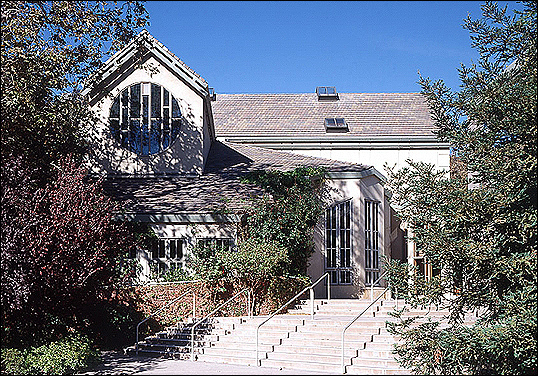 That first church building was destroyed by a major fire in 1978, and was rebuilt. The current church began services in 1983. 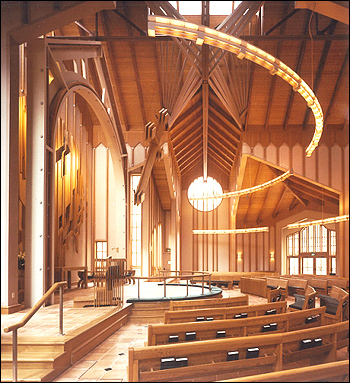 As you can see, in the photo to the right, it features a very modernist interior, by the architectural firm Moore Ruble Yudell. That futuristic look caught the eye of the legendary Mel Brooks, when he was looking for a place to film the wedding scenes from his 1987 "Star Wars" spoof, "Spaceballs". 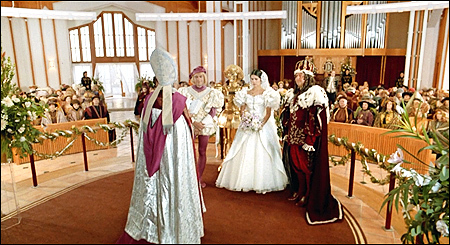 Those wedding scenes, filmed inside the church, appear at both the beginning and end of the comedy, as 'Princess Vespa' (Daphne Zuniga) runs away from her arranged marriage with the boring 'Prince Valium', and later rejects him at the altar a second time to marry the dashing hero of the film, 'Lone Starr' (Bill Pullman). Getting there: St. Matthew's Church is located a bit off the beaten path. It's in the foothills of Pacific Palisades, north of Sunset Blvd, as Sunset weaves its way to the ocean (not far from the Lake Shrine). From Sunset & Pacific Coast Highway, take Sunset inland less than two miles, and turn left (north) on Bienveneda Ave. Take Bienveneda north, less than half a mile, and (watching for traffic) carefully turn left (west) into their parking lot. 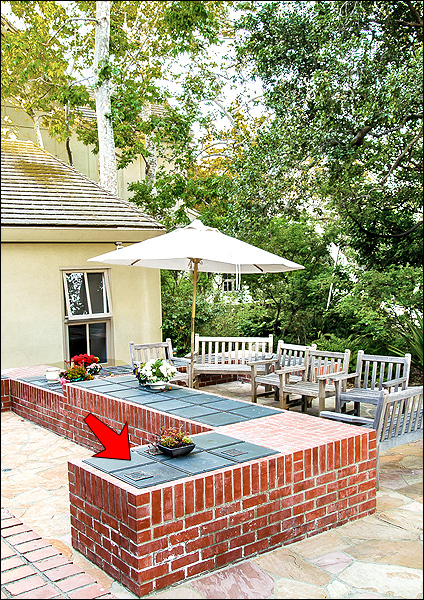 The small columbarium is located behind the church, northwest of the parking lot. Here is a Google StreetView of the entrance.